Bengaluru/New Delhi: A strike this week by drivers of Ola and Uber turned out to be a damp squib, but highlighted the tough business model of cab-hailing platforms that requires them to squeeze drivers to generate higher margins, analysts and drivers said. On Monday, drivers at Ola and Uber went on an indefinite strike to protest against low incomes, but apart from Mumbai, cab drivers in other major cities didn’t participate in the strike in large numbers. Until early 2017, Ola and Uber used to hand out many incentives to attract drivers, often from other professions. After luring hundreds of thousands of drivers, both Ola (ANI Technologies Pvt. Ltd) and Uber (Uber India Systems Pvt. Ltd) had to slash incentives over the past 15 months because of investor pressure to cut losses. Despite protests by cab drivers, Ola and Uber continued to reduce incentives through last year. Incentives as a proportion of overall ride value fell to 17% in the September quarter of 2017 from as much as 62% in the year-ago period, according to market research and consultancy firm RedSeer Consulting. “When Uber and Ola came to India first, they assured drivers something like Rs100,000-150,000 per month. But now, drivers are earning just Rs20,000 every month, of which Rs5,000-10,000 goes for EMI," said Tanveer Pasha, president of Ola, Taxiforsure and Uber drivers and owners association. Drivers on Ola and Uber aren’t employed by the companies. Drivers either own their cabs or work for middlemen who own several cabs. Cab drivers want higher incomes but Ola and Uber are more interested in increasing their margins—this conflict at the heart of the aggregator model will become worse as Ola and Uber will have to further cut losses as they attempt to go public. Indeed, for all internet marketplaces, this is a problem. Third-party sellers at Flipkart and Amazon have also complained about increasing commission rates and higher shipping and other charges. 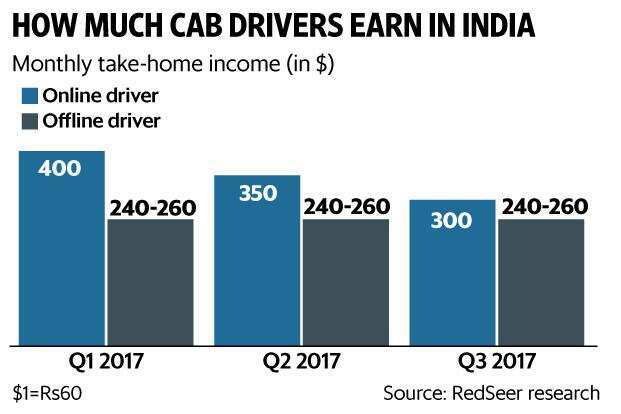 For Ola and Uber, the drop in incentives, which accounted for a large chunk of the incomes earned by cab drivers, has led to lower cab supply. The last time cab drivers struck work in the March quarter of 2017, cab supply slumped by 25%, according to RedSeer. Tens of thousands of drivers have left these platforms altogether last year and more may leave in the coming months, according to drivers and industry observers. Surendra Kumar Tiwari, who has been driving for Uber for three years, said he will end his association with the company. “They used to charge 5% two-and-a-half years back, then it was 10% and now we are paying 25% commission for the last year-and-a-half. I am not able to service my personal loan for the vehicle and plan to go back to a private taxi contractor," Tiwari said. Drivers said they will strike work again. Sarvoday Driver Welfare Association, a Delhi-based union of drivers associated with Ola and Uber, has called for a strike on 22 March. The union expects a turnout of about 20,000 drivers and is demanding that the cab-hailing firms significantly increase fares from Rs6 per km and reduce their commission rates of 25% per ride, among other things. Pasha said his association will organize a strike in Karnataka when the new government comes to power. “Whoever it is, we will put our demands at the beginning itself, and we will give the government a certain time to solve our issues. If they don’t solve, we will go for an indefinite strike in Karnataka," Pasha added. Sanchit Vir Gogia, the founder and chief executive at consultancy Greyhound Research, said cab firms have shifted focus from increasing capacity to improving utilization of their existing fleet, which will result in a drop in supply. “Our estimates suggest that in the next 12 months, 25-30% of the pool of drivers with these companies will not exist anymore simply because there isn’t enough demand to be catered to. This is contingent on the fact that status quo is maintained in terms of incentives schemes," Gogia said. An Ola spokesperson said the “interest of our driver partners and customer convenience is of paramount importance to us". The spokesperson said that while the company has seen a “slight improvement in our services in Mumbai, however, for the situation to improve significantly, it is imperative that intimidation of driver partners and vandalism of their cars by vested interests be stopped". Uber, which also pointed out instances of vandalism at the drivers’ strike in Mumbai, said the firm continues to be an attractive entrepreneurial platform for drivers. While it is hard to capture average wages, “driver earnings across India have largely remained sustainable and consistent over the last several months" and over 80% of drivers who are online for eight hours a day make between Rs1,500-Rs2,500 net after deducting 20% service fee, a company spokesperson said in an emailed response.